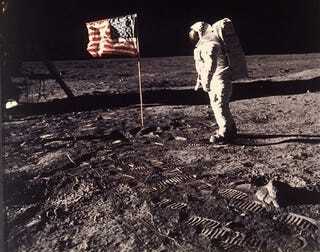 I was 9 when Neil Armstrong took that “one small step for man,” and even as a kid, I wasn’t impressed. The moon? Please. On Star Trek, they were whizzing by moons in other galaxies, and Tintin, the protagonist of my favorite series of graphic novels (even in the ‘60s they were way too fancy to be called comic books), had been to the moon, and he even took his faithful and snarky dog, Snowy, with him. As far as I was concerned, reality had a bit of catching up to do. I noticed that no one in my ever-sarcastic household seemed to share my adolescent skepticism. Instead, there was a rare bit of unity and wonder. That stuck with me, and when offered the chance to do some research a few years later, I figured it out. Neil Armstrong’s “one small step for man; one giant leap for mankind,” his statement about his first steps on the lunar surface, marked one of the last great all-American events. It was watched by an audience that, relative to its time, compares with the millions who watched Michael Jackson’s funeral. The Apollo space program was the last successful national scientific endeavor, and it came with great daring and cost. The 40th anniversary of the real moonwalk (sorry Michael, but the astronauts were first) is a good time to look back in appreciation. In the late ‘50s, a space race began, sort of an offshoot of the Cold War. American scientists were developing satellites for orbit and had hopes of advancing the technology to facilitate manned space missions, when suddenly in October 1957, with the launch of Sputnik, the Soviet Union surged past the United States. American scientists quickly mounted a response, but the first attempt at launching a satellite into orbit with Vanguard TV3 lifted off only a few feet and crashed back to earth and exploded. This spectacular failure galvanized the effort. However, the Soviet Union increased their lead in the space race in the ensuing years. Sputnik launches continued first with animals—often dogs, resulting in the nickname muttnik—but the derisive giggling ended on April 12, 1961, when Russian astronaut Yuri Garigan became the first man to orbit the Earth. Alan Shepard became the first American in space a few weeks later, but his spaceship failed to reach full orbit. On May 25, 1961, in front of a joint session of Congress, President John F. Kennedy announced that America would send a man safely to the moon before the end of the decade. It was a brash goal. America’s space program was clearly lagging behind the Soviets, and the failures combined with the Bay of Pigs fiasco was lending a sense of national uncertainty about American dominance and ingenuity. The space program characterized the ‘60s as much as Motown did but with less consistent results. First via the Mercury Program, then the Gemini Program, rocket launches became a regular part of the news. John Glenn, who later became a U.S. senator, was the first American to orbit the Earth, and by the mid-‘60s manned space missions were quarterly events, but they weren’t without drama. Gemini 8, captained by Armstrong in his first space mission spun out of control in space and had to return to Earth early. The danger was reinforced when the first Apollo mission in January 1967 ended tragically. During a dry run, a fire broke out in the cockpit killing all three astronauts. The Apollo missions resumed in October 1968 and moved at a furious pace to meet the goal. Missions left every eight to 10 weeks, accomplishing missions to first orbit the moon and to test the viability of the lunar module. Finally, in mid-July, Apollo 11 made it to the moon, and Armstrong made his historic walk. The Soviets had been passed and lapped. Several subsequent missions followed, and of course, Apollo 13 gave rise to the phrase “Houston, we have a problem,” as an oxygen tank exploded and the astronauts had to use the lunar module as a return vehicle. The last moonwalk took place in December 1972, and since then NASA’s efforts have been devoted to manned space stations and satellites. There were—and still are—a small handful of people who think the Apollo missions were all clever staging, but for the most part, the mission to the moon rose above the increasing fractious divisions that rose in American society during the ‘60s. In a way, the moonwalk couldn’t have been better timed. It arrived a year after the assassinations of Martin Luther King Jr. and Sen. Robert Kennedy, and a year before the shootings at Kent State University. President Richard Nixon was still setting up his recording system and hadn’t yet dismantled the Great Society programs he inherited from his predecessor, Lyndon B. Johnson. Thus the resentment of the space program, best voiced by Gil Scott-Heron’s “Whitey on the Moon,” wasn’t in full effect. Armstrong’s walk on the moon was an amazing first, but it was also an unfortunate last. It marked the last time that scientists were rock stars (Bill Gates and Steve Jobs are businessmen, not engineers). Science has not had this kind of grip on the public consciousness and imagination for decades, and it shows as Americans lag further and further behind in scientific skills. The best thing that could come out of this anniversary is a revival of that spirit. Right now, we’re letting science fact fall far behind science fiction.